Unitarian Universalist Fellowship of FairbanksUnitarian Universalist Fellowship of Fairbanks - A place where people of reason, humor and compassion come together to explore religion without dogma or guilt and to work for a world based on peace and justice. Humans seek transcendent experiences in many ways, whether through religion, drugs, meditation, or a variety of other methods. This Sunday, we explore this longing for the transcendent, and the many ways it can appear in our lives. At some point in our lives, we will each find ourselves in the role of “wounded person” and “healer” — perhaps both at the same time. How do the wounds we carry shape our ability to live out our compassion in this hurting world? What’s in your spiritual first aid kit? If your answer is “Um, nothing?” or “What the heck is a spiritual first aid kit?” … then this is the service for you! Join Rev. Leslie, Cam, and at least four puppets as we learn how to bind up our wounded spirits and calm the ache in our hearts. When the Rev. Dr. Martin Luther King, Jr., was assassinated in 1968, he was leading a movement called “The Poor People’s Campaign” that sought to unite oppressed Americans of all racial backgrounds. The Rev. Dr. William Barber, with the support of thousands of clergy and houses of worship across the country, is renewing Dr. King’s call for a “moral revival,” challenging the “evils of systemic racism, poverty, the war economy, ecological devastation and the nation’s distorted morality.” Rev. Leslie will share the recent history of the Poor People’s Campaign and how UUFF and the wider Fairbanks community can bring the movement home. As the proverb goes, the only reliable constant in life is change. When churches and fellowships grow, changes – both expected and unexpected – are inevitable. Join us as we reflect on the spiritual practice of embracing change and welcoming the unknown. Join us for our yearly ingathering service, a celebration of the new fellowship year! We will take part in Water Communion, offering water as a symbol of our connection to each other and the earth. We will share our stories of hope and change, growth and grief, sorrow and joy. 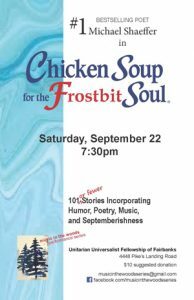 Music in the Woods presents local poet and actor Michael Shaeffer in “Chicken Soup for the Frostbit Soul.” Humor, poetry, music, and Septemberishness. 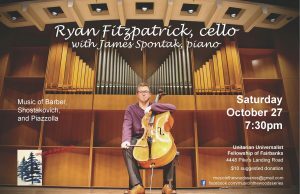 Saturday, September 22 at 7:30 in the UUFF Sanctuary. Suggested donation $10. 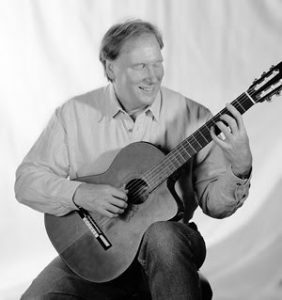 On Saturday August 11 at 7pm, UUFF will be hosting a concert by renown musician Jim Scott. Jim brings a warmth and authenticity that turns any size audience into an intimate gathering. Drawing on classic songs of peace, earth and justice along with his own well-crafted melodies and words, Jim invites us all to get involved with the ideals he raises. Honed through his years with the Paul Winter Consort, Jim’s guitar mastery and enchanting manner moved folk legend Pete Seeger to call him “Some kind of magician.” Suggested donation of $10-$20, sliding scale fee. All are welcome!